The media has demonised steroids and hoodwinked Joe public into thinking that most competitive athletic sport is essentially drug free, perpetuating the myth that there is little doping in sport.Nothing could be further from the truth. Anti-doping authorities state that using performance-enhancing drugs goes against the “spirit of sport”. The reality is that this ethos is not compatible with the “do or die” mindset that is prerequisite of success for athletes at super elite level. Virtually (if not) all elite competitive athletes who participate in a discipline requiring power as a prerequisite for success will be on some form of performance enhancing drug (PED). Without doping in sport athletes could not compete or have any chance of winning at that level . Disciplines that utilise primarily the bodies’ aerobic energy systems for their performance i.e. long distance cycling/running will additionally benefit from drugs that improve that system, so previous Tour de France winners and middle/long distance runners for example would have used blood doping which has been replaced by EPO. Doping in sport is nothing new. The use of drugs to enhance performance is supposedly considered unethical by most international sports organisations, however everyone from the athletes to the governing bodies is aware of the endemic use of drugs in sport but nobody will come clean and tell it like it is. No, they would rather scapegoat athletes, for example Ben Johnson (Seoul 1988), in order to perpetuate the myth that specific individuals are cheaters but most elite athletes are clean. Well unfortunately that hasn’t been the case for a very very long time. As I always say if you could magically now take performance enhancing drugs out of sport (as if they never existed) many of the world records would revert back to pre 1970s levels. Because the subject of doping in sport remains taboo due to gross misinformation and demonisation primarily by the media, athletes who use performance enhancing drugs (PED,s) are unlikely to admit to past, present or current use. However steroids in themselves do not make a champion, if you took drugs out of sport mostly the same guys would be at the top in my opinion. The natural genetic limit of physical performance was probably reached decades ago and the improvements in for example 100 metre sprint times are primarily down to drugs, not coaching. 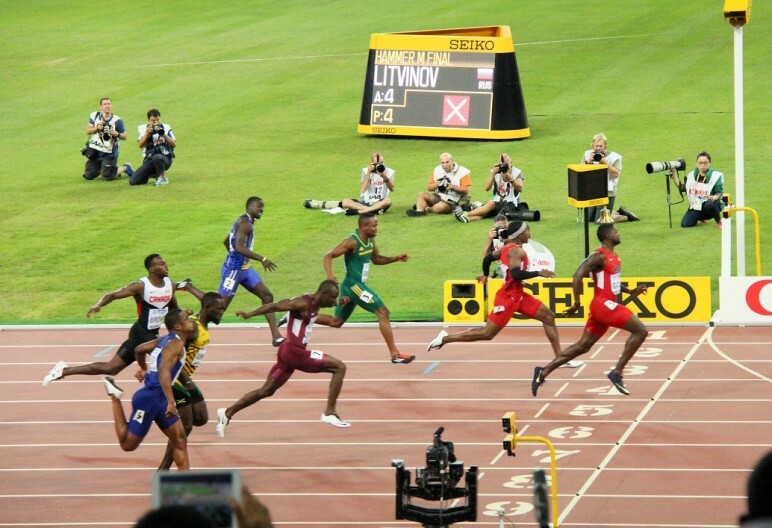 Logic would indicate that sprinters need sprint coaches to coach them to improve, however a great sprint coach could never help a track athlete as much as a great chemist can. When there is money/commercial pressures on the line, and there are drugs available that will enhance physical performance then they will be taken, and doping in sport has been prevalent for many decades. The mindset of elite athletes is such that if you gave them a choice of taking a drug that would ensure being the best, but would kill them in 5 years, most would still take it. As regard to testing – if an athlete is within the permissible testosterone and rhGH (growth hormone) ratios then he is deemed to be clean. An athlete who hasn’t increased his testosterone and rhGH levels to the maximum permissible level has little chance of achieving a world record. For example if a naturally talented sprinter has a testosterone ratio (testosterone: epitestosterone) of 1:1 which is normal, or average then he or his coach would be aware that the current W.A.D.A. guidelines permit a ratio of up to 4:1 maximum. Given the fact that the only way for a sprinter to derive an income from sprinting is to win international competitions and obtain endorsements, why would he not quadruple his testosterone ratio up to the maximum permissible of 4:1? That is a no brainer, then by utilising a number of undetectable compounds, that athlete would likely see a major improvement in his sprint times but would never ‘test positive’. The most facile argument that can be made for an athlete being clean is that he or she has yet to fail a drug test, despite undergoing rigorous testing protocols. The idea that passing a drug test indicates that the athlete is clean is a complete fallacy. The drug test is primarily an IQ test and only idiots fail them. Historically many of the most regularly tested athletes, for example Lance Armstrong, never failed a test. This is because athletes have their blood levels monitored extremely closely. Only a mistake such as a miscalculation in the timing of a steroid injection or use of a masking agent (i.e. diuretics) to dilute the levels of a steroid within the blood would result in a positive test. Although doping in sport is so prevalent,this is the reason why we don’t see many positive tests for Olympic level athletes. What many also fail to see is that the accumulated benefits of taking anabolic steroids over a number of years in terms of increased power and recovery are independent of whether that athlete is using them at the time of testing, also as regards to testing for current use, the metabolites of these compounds disappear without trace after a specific time, depending on the drug, which is known to the user. If the sport is tested he/she therefore stops using at the required time prior to potential testing. Some PED’S like growth hormone are also often cost prohibitive to test for anyhow. Doping in sport has evolved as have the methods utilised to avoid its detection. Corruption, bribes, scapegoating, cover ups, athlete protection (choosing who will be tested), etc, are all historical methods that have been contrived to hide the unpalatable truth. The federations are well aware of this of course. The current I.A.A.F. president himself was competing in an era when blood doping was being utilised by athletes and steroid use was rampant. But it’s the emperor’s new clothes. The pretense that it’s only a few bad apples who dope will not work any longer.The cat is out of the bag. Modern day athletics is all about avoiding detection. All our athletes are fighting a losing battle, unless they too start to use PEDS. All world records in any elite discipline that benefits from PEDS will have been accomplished with their aid. For example – every sprint world record I remember watching in my lifetime was achieved by the use of PEDs and I’m 57 years old. The athletes know the real rules and that is you can’t compete at top level unless you’re enhanced. It’s been that way for decades. This is the reality not the mythology that the media indoctrinate the sheep with. Russia and its athletes have recently been under the microscope and the whiff of hypocrisy emanating from governing bodies is tangible. State supported cover ups are really not that surprising seeing as national and international success for a countries’ athletes is dependent on chemical supplementation. Many of the coaches of US and European elite athletes will likely be supervising their own athlete’s drug intake and subsequent bloodwork to ensure hormone ratios remain within accepted parameters.This is nothing new but causes too much cognitive dissonance in the minds of the masses to be accepted as the truth, until the truth is laid bare.